We are excited to be able to offer our members two CSA add-ons this year! Mountain Flower Farm has had a weekly bouquet CSA for almost 20 years and this season we have made arrangements to offer it to Muddy Boots CSA members. This will be an add-on to the summer CSA share and will provide participating members with a beautiful seasonal bouquet each of the 12 weeks throughout the summer share period. First flowers of the season will likely be several weeks of peonies followed by peak summer buds including zinnias and sunflowers. Your dog called and told us he was feeling a little left out. Each Wednesday you bring home a basket of fresh, local, organic veggies for yourself, but nothing for him. So we figured out a way to solve that problem by offering a product created and made by one of our own members! Vermont Dog Eats Dog Treats are made from local proteins and vegetables and are certified organic. 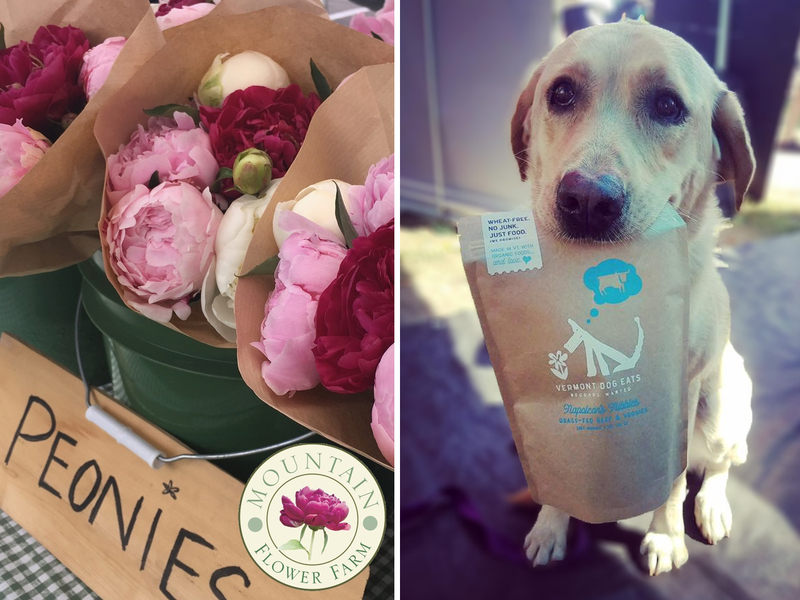 Each week, your lucky canine will get a different bag of treats and we can accommodate special requests such as grain-free and wheat-free. Just select the add-ons you want when you place your CSA order or, if you have already ordered your share for the season, complete the form again, but ONLY select the add-on and not a produce share. A Vermont Farmers’ Collaborative with weekly pick-up in the Mad River Valley. Robin McDermott, CSA Coordinator 802-496-3567 or by email. Please do not drop off cash or checks for the CSA to the farm. Please send your payments to the PO Box above.